How can technology enable effective delivery of the HR service, and how can this technology be selected and implemented into your organization successfully? Beginning with an overview of the key roles within HR and how technology can support them, Using Technology to Create Value, part of the Gower HR Transformation Series, provides a step-by-step guide detailing how to identify your requirements, develop a compelling business case and ensure that the design of the selected technology solution addresses your HR and business priorities. 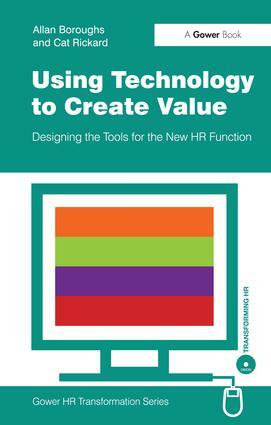 The book includes suggestions on the skills required to implement HR technology (HRT) effectively along with case studies to illustrate the types of issues and decisions that need to be taken, and shows solutions that have been developed within other organizations. About The Gower HR Transformation Series: The Human Resources function faces a continuing challenge to its role and purpose, in many organizations it has suffered from serious under-representation at strategic, board level. Yet, faced with the challenges of globalism, the need to innovate, manage knowledge, attract and retain the very best employees, organizations need an HR function that can lead from the front. The process of transforming the function is complex and rarely linear. It involves applying and managing technology to manage risk, knowledge and communication. All of which involves a highly complex and, often painful, process of change. The Gower HR Transformation Series will help; it uses a blend of conceptual frameworks, practical advice and global case study examples to cover each of the main elements of the HR transformation process. The books in the series follow a standard format to make them easy to read and reference. Together, the titles create a definitive guide from one of the leading specialist HR transformation consultancies; an organization that has been involved in HR transformation for clients as diverse as Bombardier Transportation, Marks & Spencer, Barnardo's, Oxfam, Schroders, UnitedHealth Group, Nestlé, BP, HM Prison Service, Transport for London and Vodafone. Contents: Introduction; HR roles and their technology needs; Defining what you really need; Making the case for technology; Selecting the right vendor; Designing and implementing the service; Top 10 tips for success. This series of five short books will explore and illuminate the key issues and challenges facing business leaders and HR professionals running their people management processes better. With these challenges comes the requirement of the HR function to transform but the key question is to what and how. The purpose of this series is to provide a blend of conceptual frameworks and practical advice based on real life case studies. The authors have extensive experience in all elements of HR Transformation (having between them held roles as HR Directors and Senior Business Managers across a range of blue chip industries and been senior advisors in consultancies) and have consistently come up against the challenges of what is the ideal new HR model, what is the value of HR, What is the role of the HRBP and how can they be developed. Whilst the guides all contain a mix of theories and conceptual models these are principally used to provide the books with solid frameworks. The books are pragmatic hands on guides that will assist readers in identifying what the business is required to do at each stage of the transformation process and what the likely options are that should be considered. The style is entertaining and real and will assist readers to think through both the role of the business and transformation project team members.